The Las Vegas 51's are the Triple-A affiliate of the Toronto Blue Jays, and play in the Pacific Coast League. 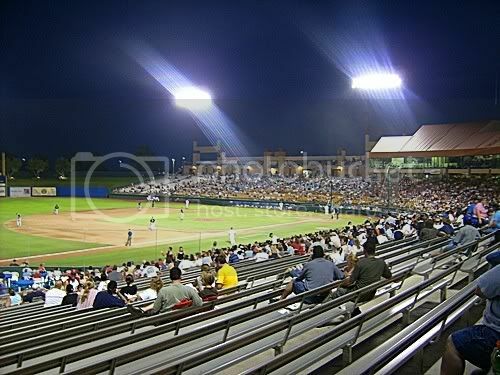 Their games are played in downtown Las Vegas at Cashman Field, adjoining the Cashman Convention Center on Las Vegas Blvd. If you follow my blog, the center is where Mirage Headliner Terry Fator opened the USBC Championship Bowling. Yes, there are 'Other' things to do in Las Vegas, and the 51's are another reason why it's such a great place to call home. The field provides an intimate setting to enjoy the games up close and personal. Parking is only $3 and with individual game seats ranging from $9 - $14 combined with numerous 51's promotions, specials and giveaway nights, it can be a reasonable evening out for the adults or the entire family. Here you have the chance to see those rehabbing or working their way up to 'The Big Show'. You can usually grab an autograph pretty easily or catch one of the fouls or many balls tossed up to fans during a game. The 51's are also known for their Fireworks Nights, like this one from a Fourth of July that Sparky put on YouTube a while back. The 51's are named for the Top Secret Military Facility at Groom Lake, Area 51. It's no surprise that the team's mascot is an alien named Cosmo. He provides comic relief and comes out with the locals youth league teams and the kids that get to participate in different events during the game. So no, you don't have to go all the way to Rachael, NV and or Nevada's 'Extraterrestrial Highway' for some 'out of this world' entertainment. Of course you may even see some Nellis AFB afterburners lighting up in the distance over the outfield wall as they head out for night missions in the Nellis Range, where Area 51 is located. The team is owned by the Stevens family from Michigan, that own several nut & bolt manufacturing plants both there and Indiana. They also have interests in both the Riviera and historic Golden Gate casinos, so don't be surprised if a winning game gets the fans a free shrimp cocktail. One of the Stevens brothers, Derek, has purchased a condo here in Las Vegas to be more active in the community. So on to a little photo taste of the 51's in a game against the Tacoma Rainiers, affiliate of the Seattle Mariners. To watch full screen, instead of using PLAY, click the HD or Full Screen button on the bottom of the player below, and when finished click it again or use the ESC key to return. Hey Great Pics! I love the 51's games. Feel like your part of the game not lost in the masses. Good specials and hard to beat for a family too. Sparky did a good job catching the fireworks. I almost always do the 4th there. Bob, Thanks! Glad you enjoyed them. The games are a fun night out and you're right, great specials, reasonably priced, and much closer to the game.